Today's meal was inspired by one of our favorite snack foods... guacamole! We just can't seem to get enough. Today we are mixing things up with the typical mayo packed chicken salad and making our healthy and delicious avocado and mango chicken salad. One of our favorite skinny substitutions is to swap out mayo for mashed avocados. Although relatively high in calories, avocados are packed with nutrition! YUM! This was so fresh and delicious. 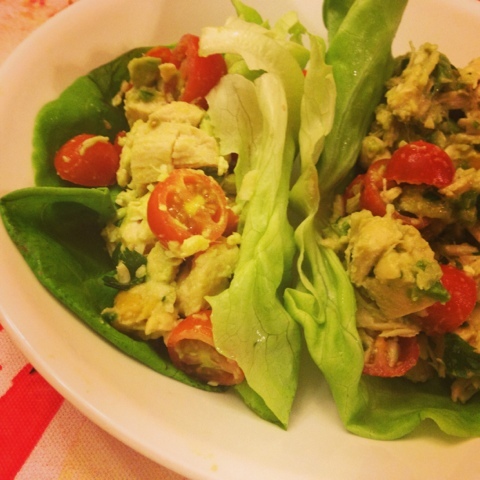 We started off this chicken salad by using boiled chicken and mixing in avocado, juicy mango chunks, grape tomatoes, garlic, yellow onion, jalapeno, cilantro and freshly squeezed lime juice. You probably won't be surprised when we tell you we wrapped this in a cool and crunchy lettuce wrap ;) We love lettuce wraps and use them all the time and save hundreds of calories by doing so! Oh my goodness! Definitely trying this, especially since I've just started a paleo diet! 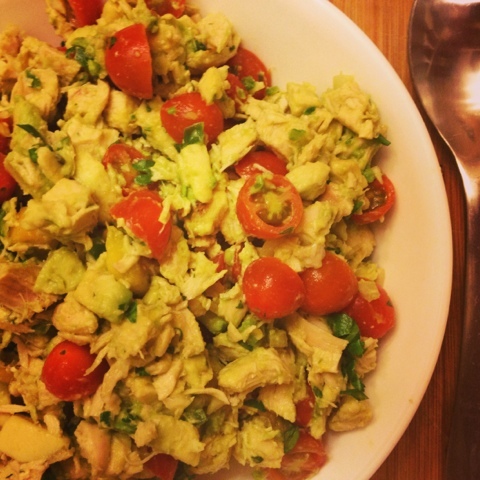 i've heard nothing but great things about avocado chicken salads-love the addition of the mango-need to try!! I was just wondering about the health benefits of boiling chicken versus steaming or grilling. Hi! We frequently boil to eliminate added calories from the cooking oils!